XO supply is a seperate power supply for all XO clock products. As with many circuits, they are all affected by the power supply. The noisy environment of digital units requires a separate supply. Although great care has been taken to minimise the influence of existing power supplies on XO-2, XO-3 or XO-DAC, XO supply enhances the sound quality of all these units, due to galvanic isolation and a novel, nearly forgotten filtering technique. XO-Supply separately powers XO-2, XO-3 or XO-DAC, It can be retrofitted to CD players and DACs that already contain such a clock upgrade. This newly developed power supply will again upgrade your CD player or DAC, when already equipped with either XO2/3 or XO DAC. It will enhance resolution to an even higher level, and improve rhythm and pace while the sonical texture gets purer as well. Inside CD players and DACs, many circuits are active. In general one power supply transformer feeds all of them; traditionally additional voltage regulators are used. All circuits involved may affect the power supply, either by layout or design. It is therefore the best to apply full galvanic isolation for the clock circuitry by means of a separate supply. XO-Supply is equipped with a low-leakage mains transformer. It uses Schottky Barier diodes for the rectification. Additionally a choke input filter follows, hence benefits from all advantages of traditional LC filtering, a technique well known for a long time and applied on a large scale in tube amplifiers. The main advantage is the pure sine wave loading of the transformer so large current peaks are avoided. This results in virtual absence of any RF noise components in the output voltage. The choke is a proprietary design. 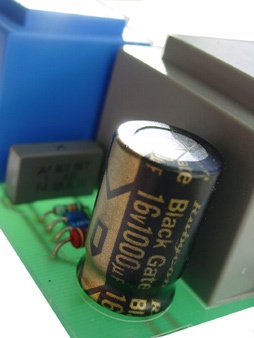 At last a high grade Black Gate smoothing capacitor smoothes the remaining voltage. The result is a passively regulated supply, with a very clean output voltage that only contains a small ripple voltage in the low end of the spectrum, but is virtually clean in the rest of the spectrum. Cascaded voltage regulators included on XO2/3 and XO DAC take care of further filtering, up to an attenuation level of 120dB over the whole audio range. XO supply can be mounted anywhere the required space is available. It needs to be connected to the mains input of the CD player or DAC and the supply input of the subsequent XO board.Assure that the power supply is switched off simultaneously with the chip that is fed by the clock circuit connected to XOsupply. XO-Supply price is set at € 74.79 each ex VAT, € 89 each incl. VAT. All ex shipping cost. XO Supply includes al wiring except the mains wiring and comes fully assembled, tested and adjusted with a 5-year full warrantee. Look at the XO Supply mounting manual for detailed mounting instructions. (not yet available).